This chart from the Tax Working Group shows how rational investors choose buying their own properties and rental properties because they have much lower marginal tax rates than investments in businesses and other savings vehicles such as KiwiSaver or term deposits. Our tax settings mean property investors are being rational when they plough their savings into homes and gear them up with debt. Bernard Hickey explains how this screws the scrum of the economy. Comment: The Tax Working Group has laid out in stark detail the imbalances in our society and economy that must be rectified if New Zealand is to become fairer and more productive. The chart above is the clearest argument yet for some form of tax on residential property that rebalances the incentives in the economy. The marginal effective tax rate on owner-occupied equity is a fifth of the tax rate on investing in any business assets or long term savings vehicles. The tax rate on investing in rental properties is around half the rate of investing elsewhere. 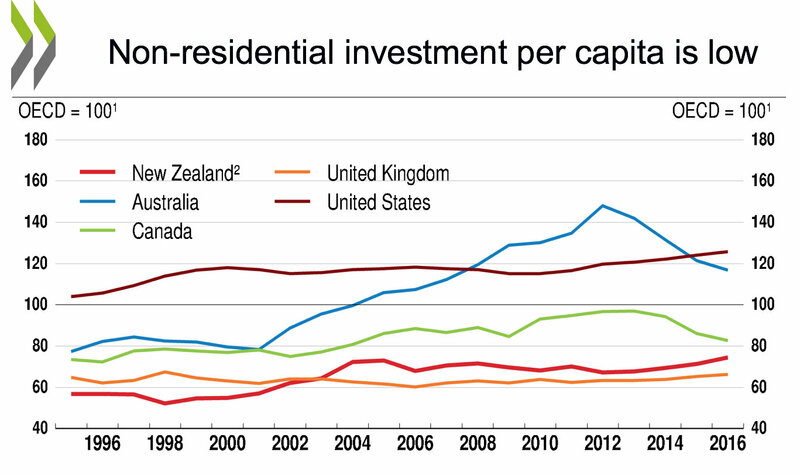 The chart shows why the national obsession with property investment is a rational option that will not go away without reform. Add in the ability to leverage the investment of equity in either your own home or rental properties and there is just no contest. Anyone with spare money to invest is being directed by our tax and banking systems to put it into housing to make super-charged and tax free capital gains. Anyone who invests in their own business, someone else's business or some sort of long term savings vehicle like Kiwisaver or a term deposit is being economically irrational. The experience of the past 20 years of property hyper-inflation and the knowledge we are systematically under-building in the face of extremely fast population growth makes buying as many houses as possible as fast as possible the surest of sure things. Investing in KiwiSaver or a term deposit makes no economic sense. It has meant, perversely, politicians have turned KiwiSaver into a parking lot for first home buyers who understand in their bones that the best place for that money is in a house under a massive mortgage. The chart explains much of our under-performance as a country over the past quarter century. Our productivity was woeful because we systematically under-invested in everything except buying and renovating houses, and buying land that has been zoned for housing. The incentives in our tax system and the way banks lend heavily against such assets mean we are better off buying a house on land or bare land that is zoned for housing because the capital gains are tax free and investors can use the interest costs to reduce any income tax bill from the land. 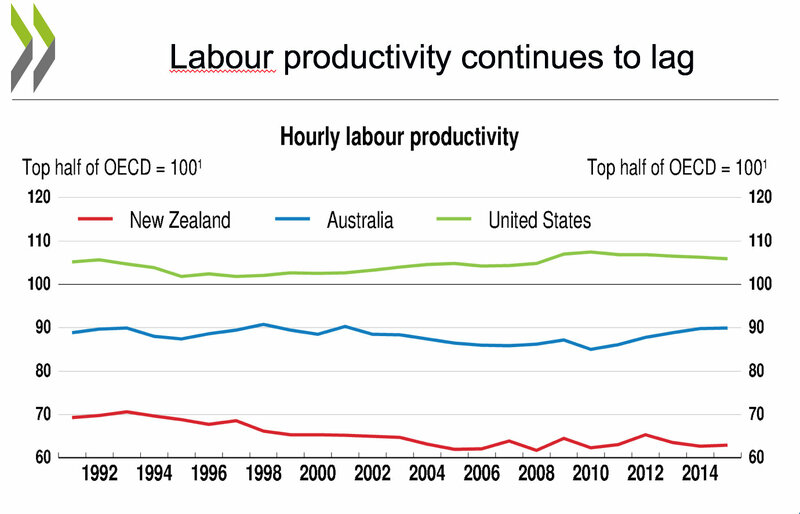 That combination of an unnaturally high New Zealand dollar and systemic under-investment in businesses, research and development and infrastructure have sucked the life out of our labour productivity growth relative to other countries such as Australia, Britain and the United States (which all have capital gains taxes). These three OECD charts below lay out in detail the end result of our tax-driven, debt-driven and completely rational obsession with property investment. Our research and development spending is about half the OECD average. 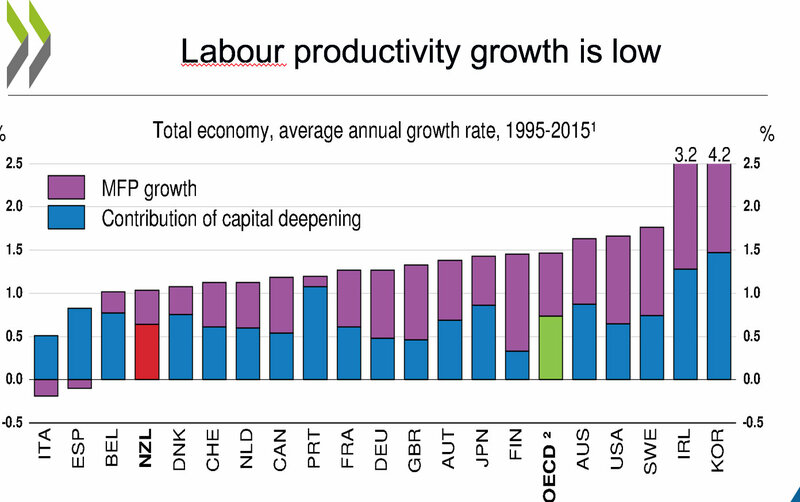 Our non-residential investment is about 60 percent of the OECD average and our hourly labour productivity is just 65 percent of the OECD average. Workers' real wages are able to rise when labour productivity grows because of better infrastructure, better skills and better use of technology and ideas from overseas. That only happens with business investment, research and development spending and deeper connections with overseas markets. In essence, only productivity growth and real investment makes us truly richer in the long run. Yet we have chosen not to do this. It could not be any clearer. Our addiction to tax free capital gains is making us relatively poorer than the rest of the developed world. Yet it is seems politically impossible to break that addiction. Property owners are the most likely to vote and they don't want to give up those unearned capital gains. This system is working perfectly for them, particularly as they use their equity windfalls to gear up with yet more debt to buy even more rental properties. Many are using those equity gains to subsidise small businesses that would otherwise fail without the effective subsidy of no capital gains tax and the ability to fund their businesses off the equity in their houses. This inability to clean out the most inefficient and least profitable small businesses and allow larger more productive businesses is another reason why productivity growth has been so weak. This combination of an economy that is biased in favour of small and domestically focused businesses that don't compete with the rest of the world is the worst possible combination for improving productivity. This lack of investment and lack of international engagement acts like a waterproof barrier to the normal diffusion of productivity-enhancing technology and practices that comes naturally in an economy that invests and engages with the world. This is the first in a series of three reports on the tax debate. The second looks at how demographic changes might force policy rebalances in favour of the young. The third looks at why a land tax to fund housing infrastructure is a better option for reform than higher taxes on income, corporate and GST.